An artist begins with a blank canvas before them sometimes with an idea in mind, other times it just evolves as the paint flows. When we enter the world I am not so sure our canvas is blank. We come with either past lives with lessons yet to learn or to a family that presents good or other times major dynamics that shape who we are. Years ago I tried my hand at stretching a canvas. It seemed easy enough when looking at a store bought one. I wanted a triangular shape and that was not conventional so not readily available in an art store. I bought the canvas, created my frame and began the process of the stretching and attaching of the canvas to the frame. It turned out ok. Not great however ok. I had in mind what I wanted to paint and set about doing so. Over the years though that canvas has been repainted a few times. Well maybe more then a few. 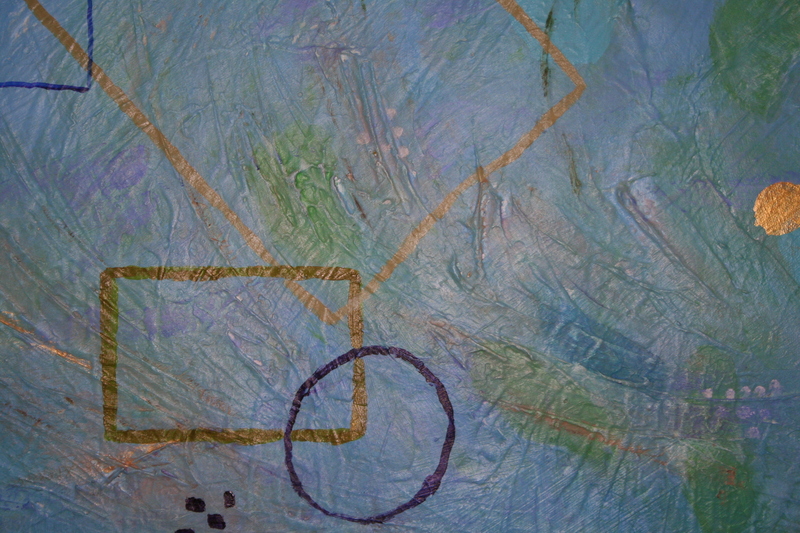 Now it has layers and layers of paint which have added to the overall texture of the canvas and so far final painting. like to paint over yet I suppose those areas add texture to the overall picture of who I am. There still remain dreams that I have yet to accomplish and now have to face that I may never accomplish those as the years become fewer left in this physical life. If I could though, I would paint over with a huge brush many areas that caused so many issues for me. I would remove those people who presented so many problems yet I suppose I learned lessons along the way albeit painful at the time. I would add brightness to my life if it were a canvas. I would add more golden moments as well. I would pursue my creative side more if I had the years back and I would do so with great abandon not caring who said what or whether someone wanted something different for me. I would try to fit in less and be truer to myself. My creative self. The triangular canvas as it is today is titled Sea Glass. The background is a muted blue as if you are looking into the edge the water flowing to shore bring bits of glass tumbled in the ocean. Little jewels that come to rest at one’s feet and little treasures presented as gifts from the sea. To display or if one can, make lovely jewelry to enjoy. 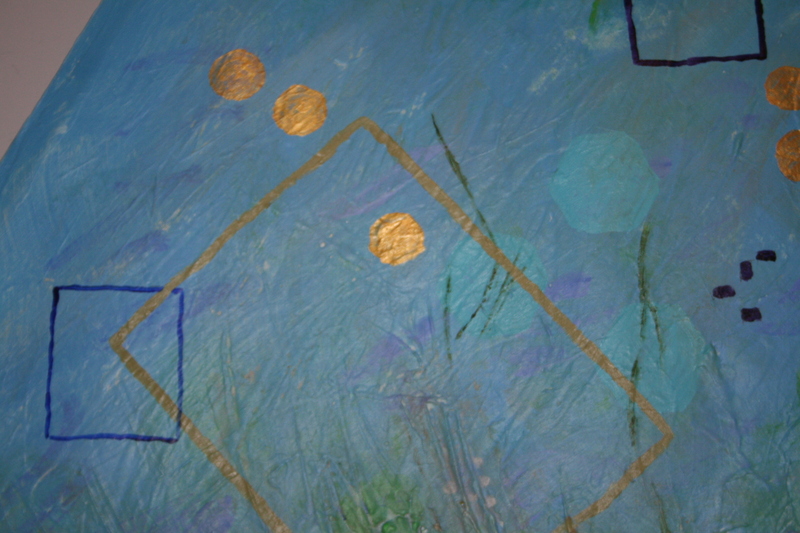 On the canvas I painted little jewels like sea glass, gold coins which offer thoughts of those golden moments some enjoyed, some missed to be captured in the next life. In many ways my life is like sea glass. It has been tumbled and tossed about. The water not always being calm, nor the current gentle. Sometimes not quite making it to shore yet always longing and trying to touch the sand. There have been people fluttering by like fish migrating to warmer waters or seeking the next morsel. There have been safe havens that allowed regrouping. Friends to float along the tide with. Much like a canvas, sea glass is ever changing until it lands to the shore. It changes colours. The sharp edges are soften. The colour deepens. The beauty grows. Yet unless someone reaches for it, it folds into the sand and repeats the process all over again washing out with the tide. If life was a canvas we could be much like sea glass, we could soften the sharp colours, the edges. We could add depth as we move along with the paint. We could paint over all the glaring mistakes we recall and wish we had been smarter, wiser, softer in our approach. Yet I suppose we need those mistakes to add depth to the canvas. The layers creating beauty as the tumbling water does to create sea glass. Maybe we just need to always have our brushes in hand and the vision to know when to add a layer of paint, or a bit of colour here, there. Maybe life is a canvas that will offer some vision of us, who we were, what we did, the good, not the mistakes and perhaps that canvas will add beauty and depth to someone else as we leave it to create yet another canvas. So If Life Was a Canvas we would always be evolving. We would be like Sea Glass smooth, soft edged, beautiful with depth. The tumbling about would add more beauty just as paint does to a canvas. If Life Was a Canvas…. This entry was posted in Uncategorized and tagged creativity, flow, golden moments, happiness, life, living, mistakes, peace.. Bookmark the permalink.